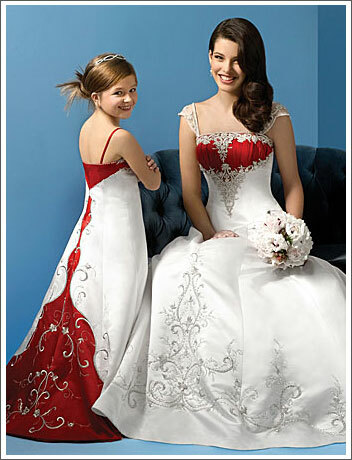 For many years, the traditional and iconic "white wedding dress" has stood as a symbol of purity in North America. But in many other parts of the world, vibrantly-coloured wedding dresses are the norm, such as in India or in China, where brides traditionally wear red bridal gowns to symbolize good luck and prosperity. If you're a bride-to-be who wants a splash of colour in your wedding day wardrobe but you aren't quite keen on head-to-toe colour, world-renowned bridal gown designer, Alfred Angelo offers a line of stunning gowns for the bride who dreams in colour. Trim accents in over 50 different colours add a stunningly unique and memorable new dimension to traditional wedding dress designs. Each of Alfred Angelo's famous fit wedding gowns are available in sizes 2-20 and 16W-28W, to suit a wide range of body shapes and styles. They also come in customizable hem lengths, from short to regular to long, and trains may also be extended for up to 48" on most gowns. The following six selections show off a number of beautiful silhouettes, exquisite embroideries and embellishments, and of course - splashes of colour. Secured with a sparkling rhinestone broach, the eye-catching emerald ribbon on this strapless satin number truly transforms it into a stunning wedding gown. Complete with a chapel train, this dress is available in white or ivory, and with 55 different colours of ribbon from which to choose. Embroidery offset with pearl and crystal beading creates a sparkling trail from the top of the lace-up back all the way down to the semi-cathedral train. 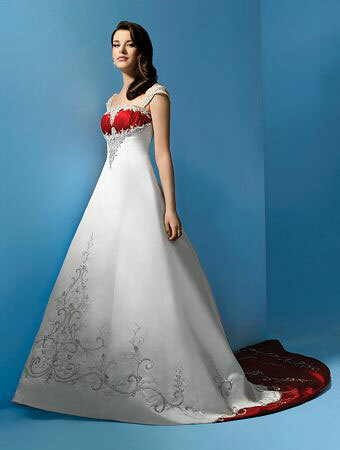 This fairy tale luster satin gown is available in white or ivory, while the bodice band also comes in 55 different colours. The optional satin halter strap shown here demonstrates just how stunning a touch of colour can be to frame your bridal gown. Featured in Angelo's plus-size collection, this gown has a lace up bodice at the back and is accented with perfectly pretty pearl and crystal beading and embroidery. The beaded, princess line bodice with waist-cinching turquoise trim is reminiscent of the same old-world glamour gowns worn by Catherine Zeta Jones in Zorro. Available in white or ivory, this gown also comes with optional beaded straps. The perfectly-pretty sage band at the bustline pulls together the entire look, and draws the eye upward to the embroidered and beaded bodice. This strapless, princess-line gown features a lace-up bodice at the back, semi-cathedral train, and optional satin halter strap and reversible modesty piece. Lush satin at the bustline creates a stunning baroque bridal gown. This dress also features metallic embroidery, crystal beading, sequins, rhinestones and comes with optional net cap sleeves which also have matching embroidery and beading. Complete with a semi-cathedral train, this dress is available in white or ivory. Where Can I Find these Dresses? Easy! Look for Alfred Angelo "Dream in Colour" boutiques, using our "Gown Finder"